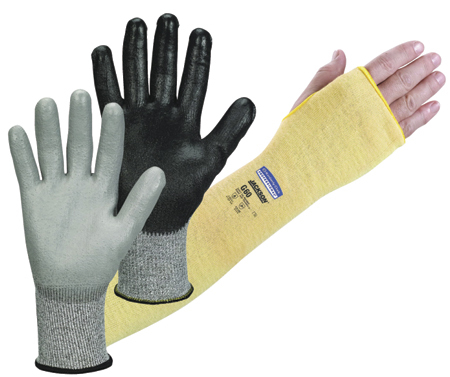 For industrial tasks that require protection against hand lacerations, cuts, abrasions and burns, Kimberly-Clark Professional, Roswell, GA, has introduced two new Jackson Safety brand cut-resistant gloves and a cut-resistant sleeve. The new Jackson Safety G60 Level 5 cut-resistant gloves are coated with polyurethane to optimize grip and dexterity. They’re made of an engineered patented yarn, and meet EN 420 standards for length. Also new are the G60 Level 3 cut-resistant gloves, designed for work environments that pose a risk of minor cuts and abrasions such as metal fabrication, automotive assembly and stamping. The Level 2 cut-resistant sleeves, available with and without a thumbhole, feature a Kevlar outer layer and a cotton inner layer. They meet ANSI Level 2/EN388 Level 2 cut resistance and EN 420 standards, offer good breathability and are suitable for intermittent heat contact to 212 F.